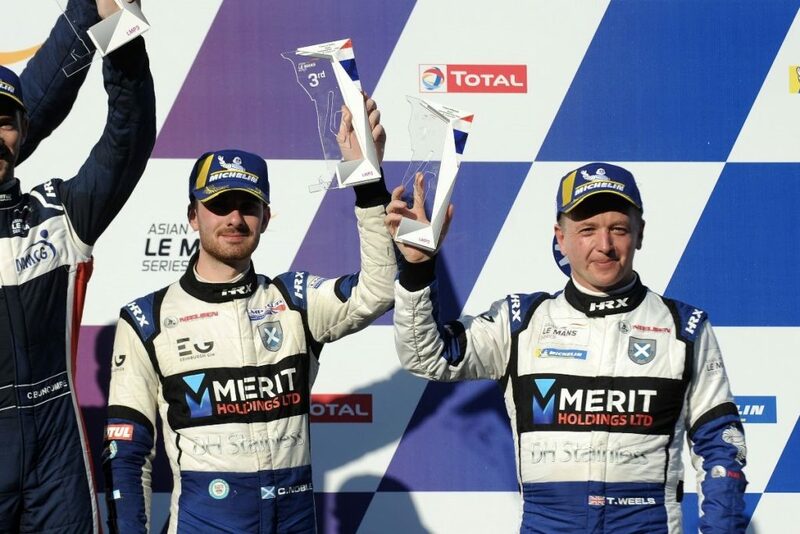 Ecurie Ecosse / Nielsen Racing enjoyed a second Asian Le Mans Series podium finish in a row January 12th at the Chang International Circuit in Thailand. Colin Noble and Tony Wells once again showed front-running pace throughout the weekend and were rewarded with a strong, third place finish in Saturday’s four-hour race. The duo started from fourth on the grid after Noble set a 1:29.988 in Qualifying, less than half a second off the eventual pole time. That laid the foundations for another strong finish. Wells started the race, and managed to stay out of trouble in the early laps. The ambient temperature was over 30 degrees’ Celsius trackside, and much higher in the cockpits of both Ecurie Ecosse Ligiers, making for a real physical test behind the wheel. When Noble climbed in, the car was down to sixth, in what was a tight-race for LMP3 class honours throughout. The young Scot fought hard though and clawed his way up to third spot during his stint, before a fuel pick-up issue blunted his pace towards the end. Rather than gun for second, he was therefore forced to consolidate and secure the #79 crew third. In the end, he finished just two seconds ahead of Ecurie Ecosse / Nielsen Racing’s sister car, the #7 of Christian Olsen and Nick Adcock. Fourth place was a well-deserved outcome after a tough weekend for the duo, in which they lost a lot of track time after an incident early in Free Practice 2 forced them to sit out Qualifying and start from the back. Adcock started the race, and he too had to deal with the conditions in the cockpit at the hottest part of the day, before coming in halfway through the race and handing the car over to Olsen up to seventh in class. During his stint, Olsen managed to drive from seventh to fourth, and was reeling in Noble in the #79 right the way to the flag. The result for the #79 puts Noble and Wells fourth in the championship, a point off third and 20 off the championship leaders with one race to go. The #7 meanwhile, is now fifth in the standings. The final race weekend of the 2018/19 Asian Le Mans Series season is set to take place at the Sepang International Circuit in Malaysia on February 22-24.